In previous year of 2018, Bangkok marked a really great spot as the most visited city in the world. For us, Bangkok is surely paradise for food lover. Everywhere you look while walking around the city, you’ll be tempted by something that look delicious. If you travel for food, this Bangkok food travel guide is definitely for you, covering quick essential information and tips on where to eat and what to eat to pamper your stomach while you are in Bangkok. Try Isaan food – Isaan food is well known for its spice and unique pungent flavor with various different kind of herbs. The classic example for isaan food is Somtum. 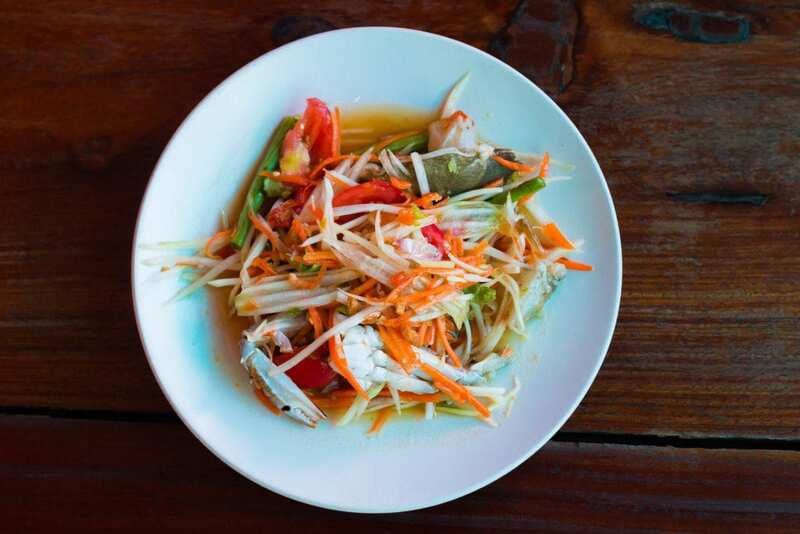 Som tam refers to green papaya salad which is a popular dish in Isaan (Northeastern Thailand) and also in Laos cuisine. Even the dish is from Northeastern Thailand, but it surely popular among Thais of any region. If you want real Isaan style, ask vendor to put pla-ra, which is s a traditional Northeastern Thai and Lao seasoning produced by fermenting fish. Most of the time, Thai people we love ordering Gai-yang which is Grilled chicken to eat together with som tum as well. When it comes to Thai food i think Som Tam (ส้มตำ) and Gai Yang (ไก่ย่าง) is the best combination. If you are vegetarian, Another Isaan food you should try is Gaeng Hed – it means mushroom soup. 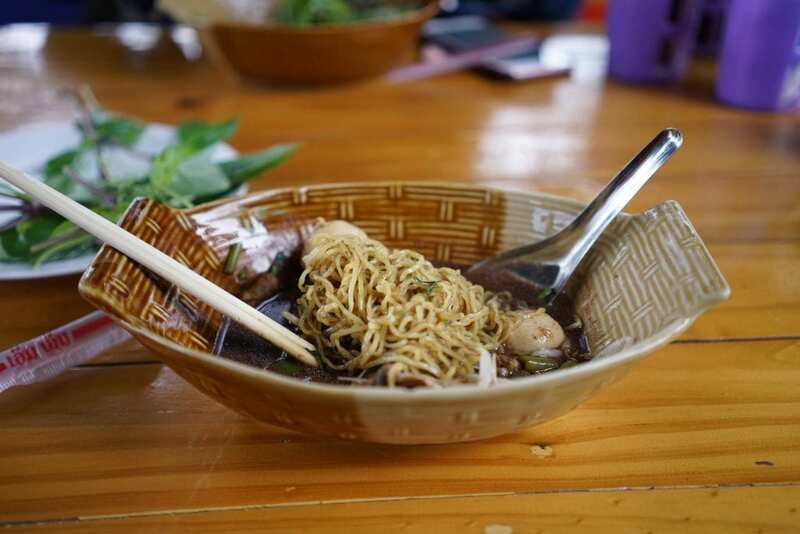 Mushrooms were often prepared in a soup along with bai yanang juice which make the color of the soup dark, they also put sweet basil and pla-ra as well. This dish is surely healthy dish filled with Vitamin D.
Some of the best dishes in Bangkok can be found at the local markets. This is where you find the real culture and amazing dishes. If your in Bangkok and want to check out some of the best markets check out 13 Iconic Markets To Visit In Bangkok. Kuay Teow. Kuay Teow means noodle, there are not various different kinds of noodles dishes with different ingredients in Thailand, Also, there are different kinds of noodles you can order for Kuay Teow as well. We will highly recommend you try ‘Kuay Teow Gai Mara‘ – Gai Mean Chicken and Mara means bitter melon. My favorite kind of noodle to go for is Sen Lek. Sen Lek is a medium flat rice flour noodle, the same kind you mostly see in pad thai. But jimmy’s favorite is Sen Bah Mee which is yellow noodle made from egg and wheat flour noodle. Try ‘Kuay teow reua‘ – It’s a pork based Thai soup noodle, and a favorite in Bangkok. We found the best area for this dish is around victory monument area of Bangkok. Kao raad gang : Kao means rice and Gaeng means curry in Thai but it doesn’t mean just rice and curry. It is the way Thai call the dishes that are already prepared and ready to order – mainly the rice topped with various different kind of Thai food. Therefore, you can expect to see a bunch of variety Thai dish that you can ordered in just one plate. Kao raad gang is also well known on low price compared to other kind of Thai food as well. One of the best and easiest way to find Kao rad Gang is to go to Food court in the mall for us, food court is the best places to taste wide range of Thai food. One essential thing you need to know is – The first thing to do is pick up a value card from the cash desk because payment is not accepted at the stalls in food court. 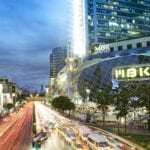 If you are looking for a place to stay while seeing this amazing city don’t forget to check out the best hostels in Bangkok. Aharn Tam sung : Aharn means food, Tam Sung mean follow your order. Aharn tam sung can be easily found all over Bangkok, normally it is at local shophouse type of restaurant. Different from Kao Raad Gaeng, The way you go for Aharn Tam Sung is to actually tell vendors what you would like to have, either it be Thai fried rice, curry, soup, stir fried food – We guarantee that the vendors can make them all for you. Kao Niew Moo Ping : You probably know Kao Neaw already from Mango sticky rice. Yes, Kao Niew basically means skicky rice, Mhoo means pork and Ping is gill. This is popular quick breakfast among Thai. the advantage is – this food really good for making you full fast! You can easily find Khao Niew Moo Ping at local market or crowded places for Thais such as bus stop. Also almost any morning market will have Kao Neaw Moo Ping available, look for the person with a charcoal grill and cooking sticks of delicious savory pork. I promise you wont regret it. For me (Jimmy) This is my favorite Thai breakfast, paired with sticky rice i’m not sure it can get better. Ruam Mit Nam Ka-Thi / Thai Mix Dessert Recipe with coconut milk one of the most popular Thai dessert. It looks super strange because it’s a combination of some Thai dessert with coconut milk in one serving depend on your choice. This amazing snack is something like i have never seen before. It looks like a bowl with mild ice and tons of multi colored jelly. Gafair Yen – Gafair mean coffee, yen means cold. 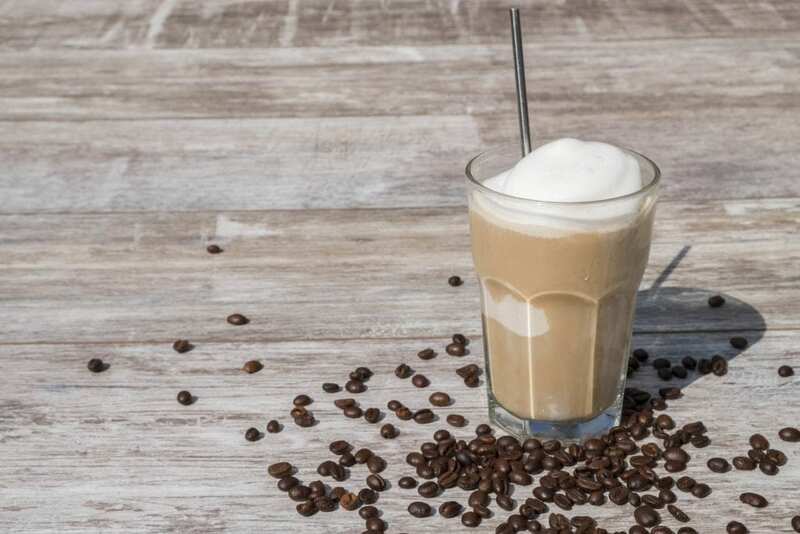 what make Thai iced coffee so special in my opinion is the way the mix condensed milk and cream which will give sweet flavour. Its a lot like Vietnamese coffee, very sweet and creamy due to the condensed milk and they are everywhere in Thailand for about only 30 baht. With it being so cheap, savory and convenient we cant help but love them. 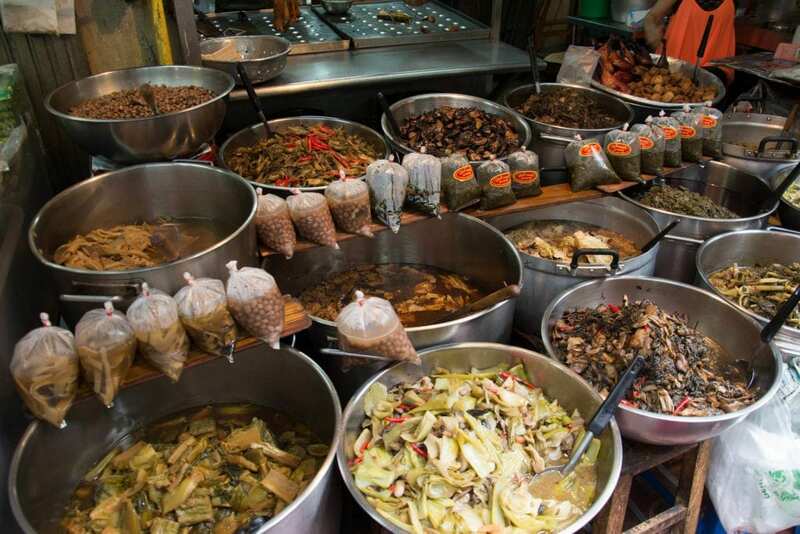 Being in Thailand there are a vast variety of food to choose from but being in Bangkok it makes it even harder. 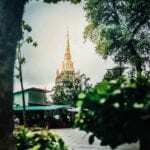 Bangkok is like the hub for everyone to find work, that means if you live anywhere in Thailand and you need more work variety and opportunity, you move to Bangkok. That being said Bangkok is rich in many unique flavors from all over the country making it nearly impossible to try them all. With one of us being a local and one being a foreigner i think that we covered a special taste for just about everyone. We have also created a cheat sheet to help you try the most local places shops. If you don’t speak Thai, not a problem with this sheet you will know all the essential words when getting food. 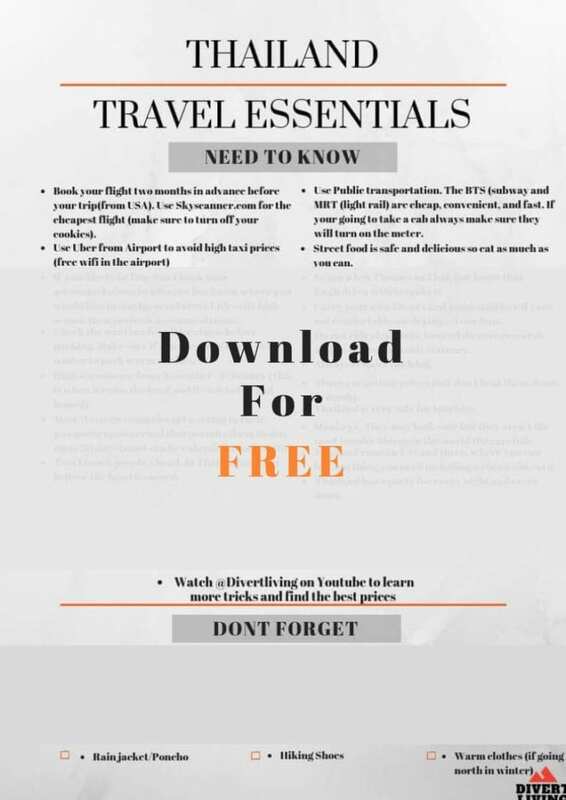 Also if you are in the process of planning your trip make sure you check out out FREE travel knowledge and packing essential checklist. 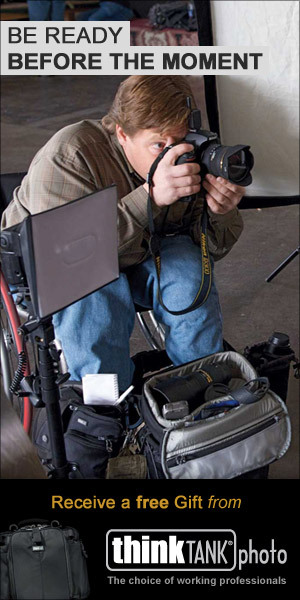 If will tell you some key things to help make your trip super easy and make sure you are well prepared. Philippines Vs Thailand - What to Choose?